By definition, simplicity is easier to understand and appreciate than complexity. Keeping it simple was the brief for this Valentine’s bag, and they’ve hit the nail on the head! A simple matt white paper bag is used, featuring gorgeous red satin ribbon handles. To bring this paper bag’s design together, a single blood red heart is added with a foil finish – matching the ribbon handles. 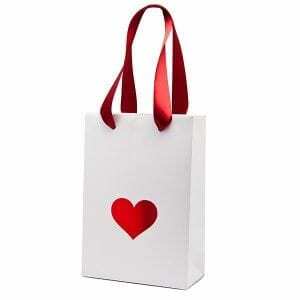 All this Valentine’s gift bag needs is a corporate logo above the heart and it’s perfect for retail use! Nothing says ‘I love you’ quite like a gift bag covered in hearts with the words LOVE YOU printed on the side. This gift bag utilises the concept of texture to catch the onlooker’s eye – with wood grain graphics running along the sides and within the bag itself. 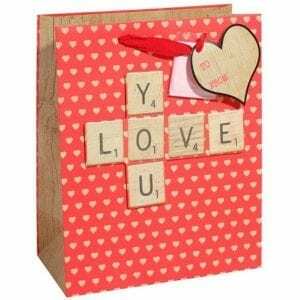 A bright red handle adds to the theme of the month, with a wood-texture heart card added to complete the look. This Valentine’s gift bag also has a little folded up square of tissue paper attached for a finishing touch when you place the gift within. Much like the first Valentine’s bag we looked at, this one stuck to simplicity in order to draw attention to the feature elements. 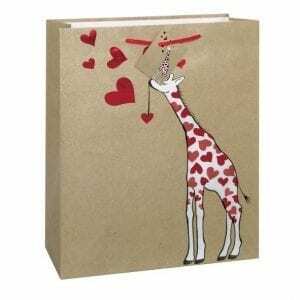 A simple, plain natural brown paper bag is rendered stunning with the use of a few red foil hearts floating close to the opening, with an abstract Giraffe holding up a heart – covered in hearts instead of spots. Everything about this Valentine’s gift bag shouts LOVE, so it’s no wonder we fell head over heals for it as soon as we spotted it! Offering customers or patrons branded paper bags instead of the regular boring ones is sure to impress them – especially if your paper bags are themed to the seasons or to a special occasion like Valentine’s Day. For all your paper bag printing and distributing requirements, get in touch with Kiki Bag here – we can’t wait to hear from you!